Tanaya Winder is from the Southern Ute and Duckwater Shoshone Nations. She graduated from Stanford University in 2008 with a BA in English. Tanaya was a finalist in the 2009 Joy Harjo Poetry Competition and a winner of the A Room Of Her Own Foundation's Spring 2010 Orlando prize in poetry. 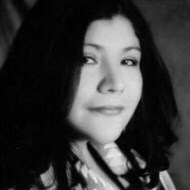 Her work appears in Cutthroat magazine, Yellow Medicine Review, Adobe Walls, Barrier Islands Review, and Lingerpost. She is the co-editor of a forthcoming collection Soul Talk, Song Language: Conversations with Joy Harjo. She is currently pursuing a MFA in Poetry at the University of New Mexico. no monsters, or heroes—just two unnamed bodies in history. into monuments assembled in longing. the body begsat the soul's release please do not leave. longing to hold something precious.